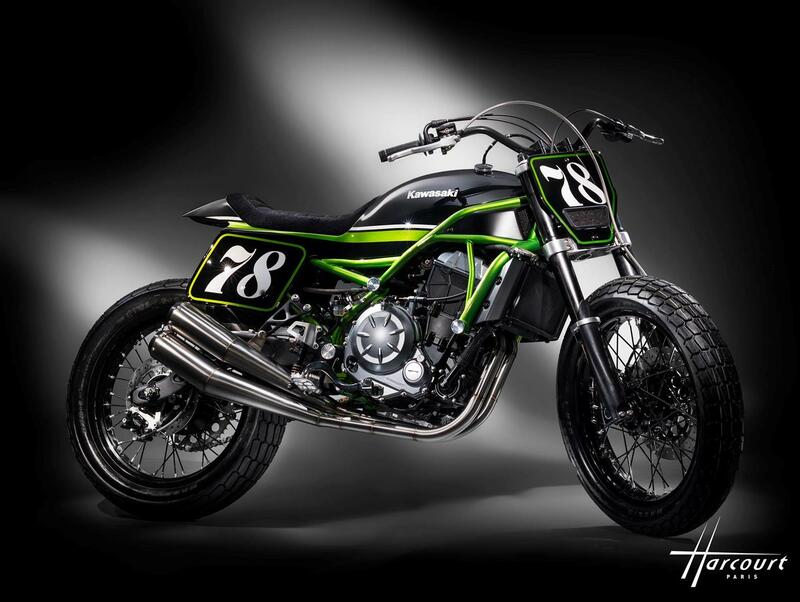 Unveiled at “Chantilly Art & Elegance Richard Mille” at the Chantilly Castle event over the weekend, was Kawasaki’s new-for-2017 Z650 transformed into a flat tracker. Custom outfit, MRS Oficina were commissioned by Kawasaki France to do something special with the Z650, and the end result is the above bike full of character and style. The bike uses a custom-made exhaust system. The tank and seat unit have also been made as a bespoke single unit and keep the lines of the bike flush and giving the bike plenty of attitude. The bits such as the headlights, tail lights and indicators have all been removed, because who needs them anyway? Number boards look so much better. The cast wheels have been replaced with a pair of spoked alternatives. The front wheel has been replaced with a larger 19-inch, both with dedicated Flat Track tyres. The front has been converted to feature a single brake disc, with the stopping power dedicated to Beringer brakes. It isn’t the first time the French outfit have put their hand to Kawasaki machinery either, with a previous commission that saw them build a stunning café racer that was based on a Vulcan S.
Despite such beautiful artistry, rival manufacturers, such BMW, Triumph, Yamaha and Honda, started offering classically-styled machinery earlier in the wake of the custom revolution that has come to light in the past few years. With the announcement of the new Z900RS and this Z650 commission though, could that all be about to change?